I used my Prisma Pencils to color this super cute and cuddly Ribbon Bear (FREEBIE!) and layered some finely glittered fabric tulle over Basic Grey, Sultry Collection DP. Our DT Sister, Bonnie has been feeling down since learning the news that her friend, Elise was recently diagnosed with Breast Cancer. Many of us have followed Jacque's journey this year with Breast Cancer. We are all affected by this disease in one form or another and we can all do one thing to protect ourselves. SELF EXAMS! It's quick and simple and can save your life. The M5D girls rallied together this past week to not only cheer up our sweet Bonnie's spirits but to help bring Awarness to such an important issue that affects us all. there is one stipulation before you download him. You have to promise to perform a self exam! do this for Yourself ...and... your Family! 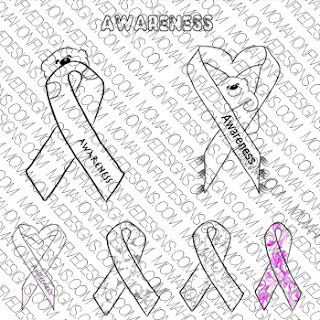 As an added BONUS, we also came up with a set of 7 Breast Cancer Awareness Images to buy! We'd love it if you would help us Spread The Word by displaying one of our blinkies or badges on your blog. My Partner in Crafting Crime - Use material on your card (I've used Tulle over the background dp). This bear is just adorable, wonderful card for this challenge. Thank you for joining us at Stampin Sisters in Christ. Oh this is so cute! 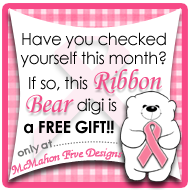 Love your layout and this cute bear and sparkly pink ribbon! Thanks for joining us at Stampin Sisters in Christ! ahhhh such a cuttie ;) love the paper you used.. great job! Thank you for playing with us with the anything goes challenge at MelJens Designs this week! Good Luck! This is wonderful! I love the bear, so cute! Thanks for joining us this week at Stampin Sisters in Christ. Your bear is wicked cute! I love the colors and that sparkly paper is just stunning. Great job! Very cute, love the sparkle! I just love your sweet card! The coloring is beautiful!!! Thanks for sharing with us and for joining Speedy's Friends on our special anniversary week! 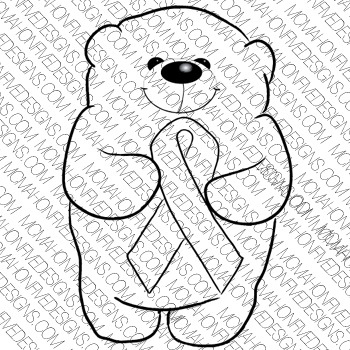 Love this sweet bear with a wonderful cause! Thank you, Michelle, for sharing this precious card with the Friends for Speedy the Cat in this week's die cut/punch challenge! Such a cute card for a great message! Thanks for playing with Speedy's Friends!